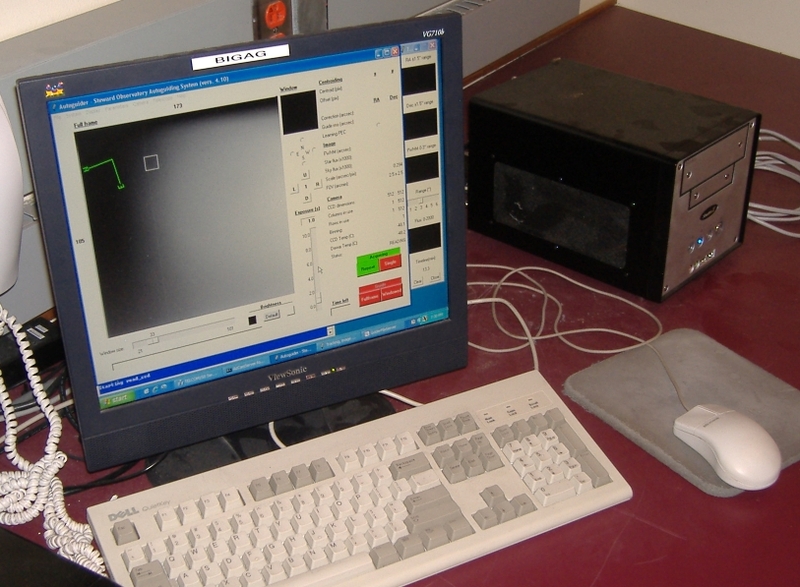 Basic information about the CCD guider dewar and detector (BigGuider). Observer and Instrument safety (in case you need assistance...). Guider Operations and the Control GUI. Moving the Guider Probe to Find a Guide Star. This manual is intended to be a convenient reference guide for observers certified to use the Kuiper telescope and CCD Guider System (BigGuider). Contact the Steward Observatory (SO) operations office (621-5136; bpeterson@as.arizona.edu) or Paul Smith (621-2779; psmith@as.arizona.edu) if you need to be certified. Emphasis is placed on the safely of observers and the equipment in this document. A hardcopy of this manual is located in the 61" control room. In the event of a discrepancy between the Web and hardcopy versions of this manual, the Web version will take precedence. The manual was created with the help of Mike Bradshaw, Greg Stafford, Joe Hoscheidt, Dave Harvey, Jim Grantham, and Gary Rosenbaum. Mike Lesser and Gary Schmidt developed the Steward Observatory CCD guiding systems and along with Dave Baxter, Bob Peterson, and Jeff Rill also contributed to this guide. Comments, corrections, and suggestions for this manual should be directed to Paul Smith. 2. Basic Information About BigGuider. See also the ITL CCD Systems page. 3. Observer and Instrument Safety (In case you need assistance...). IMPORTANT: Please read the Guidelines for Observing at Steward Observatory telescopes. After hours phone numbers of these individuals can be found in the 61" control room. There MUST be a certified observer present in order to operate the telescope and instrumentation. Observers should be especially alert to potential hazards while at the observatory since usually there will be no one else at the site during normal operations. In addition, help is many minutes away even assuming that you can successfully call for help in an emergency. Please remember that moving telescopes and domes are heavy, unforgiving pieces of machinery that can do serious damage. The observatory staff does its best to make the site as safe as possible, but we urge you to report any potential hazards immediately. Please report any problems encountered with BigGuider in that night's Trouble Report. Be as detailed as possible. It may also help in diagnosing problems if relevant guider CCD images are saved and identified so that they can be found and examined by support/technical personnel. Turn on the power to the BigGuider CCD controller. 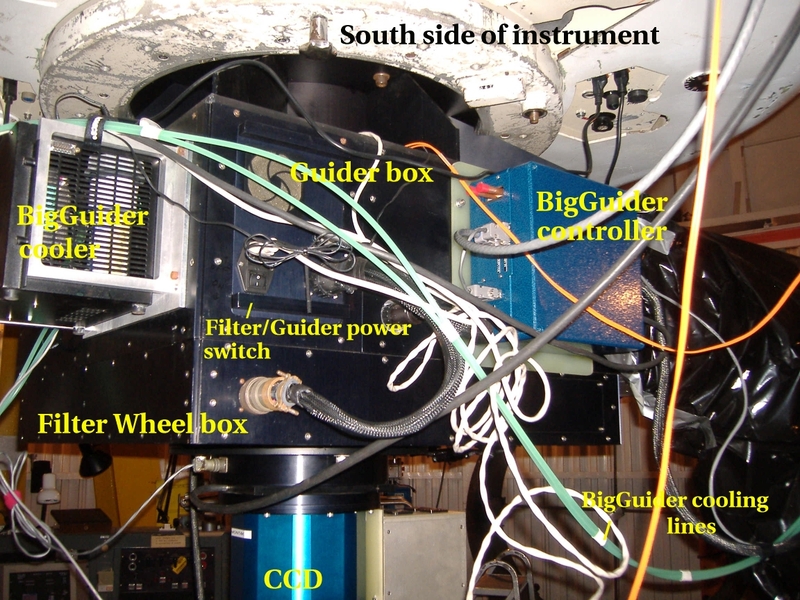 The dark blue controller is mounted located on the south side of the guider box if the instrument is mounted to the telescope in the usual (default) fashion. Turn on the cooling unit. It is located on the west side of the guider box. The toggle switch must be pulled out in order to be toggled. A green light on the cooling unit will show when the red button is pushed if the cooling fluid is being adequately circulated to the guider CCD dewar. Power on the guider x-y stage. 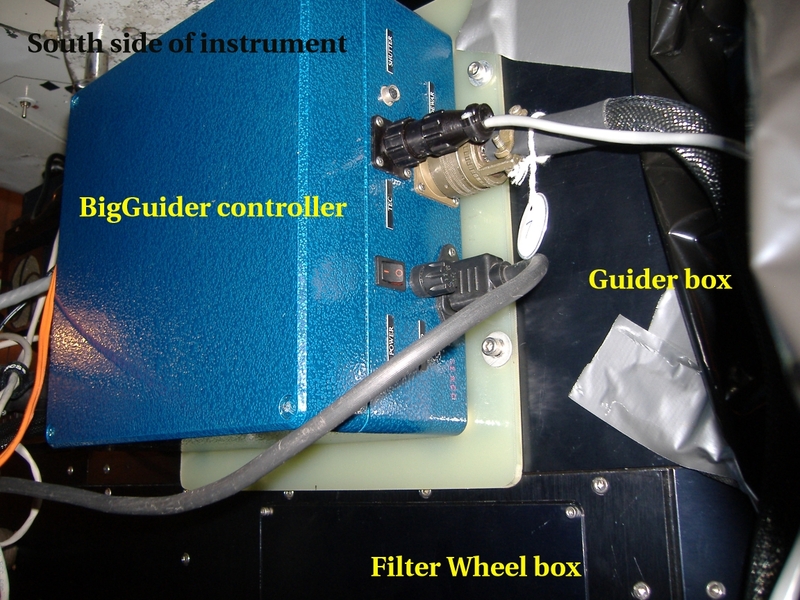 The switch is located on the south side of the guider box and is west of the BigGuider controller. This switch also powers on the filter wheel of Mont4K and will already be on if the Mont4K has been properly powered up. With the bigag PC booted, click on the "TELCOM150 Server" and "Start BigGuider" icons (in that order). The TELCOM150 server will already be running if you have already started up Mont4K. Once the camera is automatically initialized and ready for use, one may set parameters, take pictures, guide, etc. On the kuiper computer, startup the filter wheel GUI (this step is also part of the normal startup procedure of Mont4K and the GUI can only be brought up if the galilserver has been initiated). This GUI includes control of the guider x-y stage. With this GUI, you can move the guider pickoff mirror around to locate suitable guide stars. Be advised that there are NO hard limits imposed on the motion of the x-y stage that prevent the stage/pickoff mirror from vignetting the field of view of the science detector. See below for a listing of x-y stage encoder values that safely keep the guider mechanism from interfering with your science exposures. Using the GUI, HOME both the X & Y motors of the guide probe. 5. Guider Operations and the Control GUI. The BigGuider control GUI is pictured below (the large window taking up most of the example screenshot) and runs on the bigag PC. 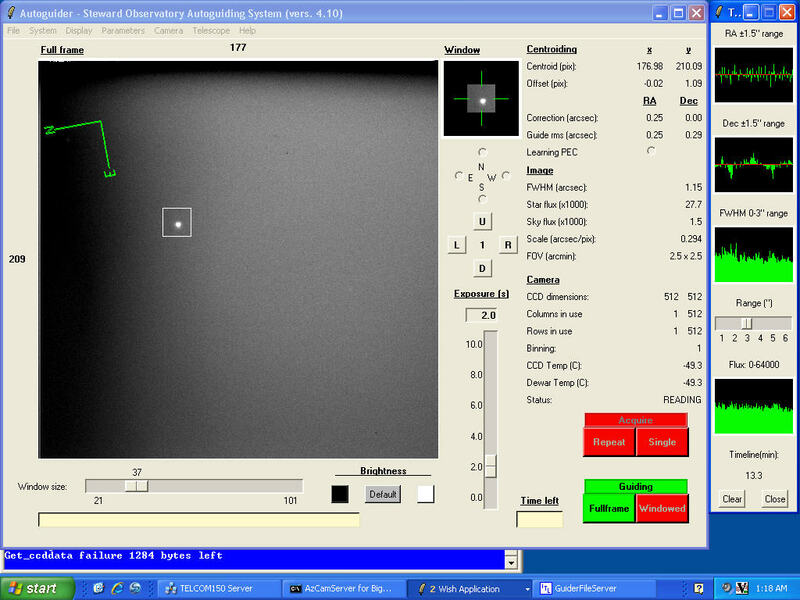 In the lower right corner of the GUI, 4 large buttons allow you to take a single or repeated exposures with the guider CCD, or start a guiding sequence (either full frame or within the smaller guider window denoted by the white square overlaid on the field of view). Important note: "windowed" guiding in not implemented for this system. That is, make sure that you use the "full-frame" guiding mode. The exposure time can be set using the vertical slide bar to the left of "Acquire" and "Guiding" buttons, or by typing the desired exposure time within the box above the slide bar. Exposures can be as short as 0.1s. The exposure time can be adjusted without stopping an exposure or guiding sequence. Clicking on the desired star in the field will center the guiding box on the star. The size of the guiding box can be adjusted using the horizontal slide bar in the lower left corner of the GUI. Make sure to leave some sky around the guide star so that the background can be properly determined within the guiding algorithm. Messages from the guider to the telescope or to you are highlighted in red and displayed below the guider window size slider. The guiding centroid position can be adjusted using the 'L'eft, 'R'ight, 'U'p, and 'D'own buttons. The number displayed in the center of these buttons is the number of pixels that the guiding window will be moved for each click on a button (this number can be changed via the "Edit guiding parameters" option in the "Parameters" menu). This adjustment of positioning can be made while guiding is in progress. Before guiding can commence, the guider needs to know which way is north and east and the pixel scale. This information is supplied to the guider by doing an x-y transformation (found in the "Telescope" menu). The task steps the telescope through a series of moves. The observer is prompted to click on a chosen star after each move. Moves of 30" in both Dec and RA are adequate for the transformation and won't move the star out of the field of view if one is chosen reasonably close to the center of the field. This step is only needed once as long as the guider box is not rotated on the telescope. Once the transformation is complete, the image will display a compass and the centroiding and image information given along the right edge of the GUI will be correct. It is recommended that you do a transformation at the beginning of your observing run or after the instrument has been rotated on the telescope. While guiding, strip charts that track the guiding corrections in RA and Dec, the FWHM of the guide star, and the guide star flux can be displayed. The tracking charts are shown in the example screenshot on the right side of the screen. This option needs to be chosen, if desired, before a guiding sequence is started and is very useful if one wants to track guiding performance, seeing/focus, and whether it is truly photometric. Once the strip chart window has been selected, it will be operational until it is closed (i.e., one does not need to bring up a new strip chart window at the start of a new guiding sequence). The charts are displayed be default, but can also be selected from the "Display" menu. Cross hairs can manually be placed or erased on the image display. See the "Display" menu to create or destroy markers. 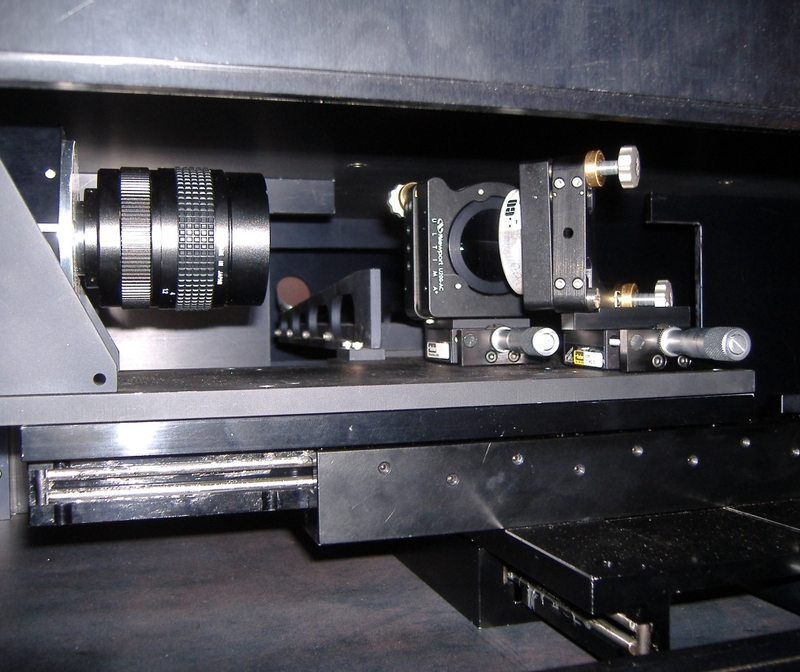 The guider can be used to offset the telescope if desired and if an x-y transformation has been performed. Enter the "Telescope" menu (this menu can be reached from going to the top edge of the GUI, or by using the right mouse button while within the image frame) and selecting "Telescope Offset", click on a position within the image frame and then click on a position within the frame that you would like the telescope to offset to. Alternatively, offsets in RA and/or Dec can be entered in the appropriate boxes within the "Offset Telescope" pop up window to move the telescope the desired amount and direction. Many other options are available within the BigGuider GUI. Explore the menus to see if any will be useful for your observing program. 6. Moving the Guider Probe to Find a Guide Star. The guider probe can be moved to find a suitable guide star for the science field. The GUI contolling the positioning of the x-y stage that allows the pickoff mirror to be moved around the focal plane can be accessed on the kuiper computer (start the galilserver and filter wheel GUI). The effect on the Mont4K field of view of the guider probe has been mapped and observers should avoid the regions outside of those listed below if an unvignetted science image is desired. The guider probe position displayed in the GUI will be highlighted in RED if the probe is vignetting the Mont4K CCD field of view or if the probe is so far from the optical axis that its FOV is blocked. A position highlighted in GREEN indicates that the guider is not interfering with the science FOV and that there is the possibility of having a suitable guide star within the guider FOV. Guiding is recommended with the guider probe at or near its default position (X=2000, Y=2000; see the important note at the bottom of this section). When 1000 < Y < 3000, X can range from 1000 to 14000 (the guider probe is NORTH of the science FOV). When 3000 < Y < 13000, X MUST be in the range from 1000 to 2500 (the guider probe is WEST of the science FOV). When 13000 < Y < 15000, X can range from 1000 to 14000 (the guider probe is SOUTH of the science FOV). Note that the guider field of view is substantially vignetted when either X or Y is within 1500 units of the travel limits for the guider probe (e.g., a setting of X=2000, Y=2000 is better than X=1500, Y=1500 which is better than X=1000, Y=1000). Hitting the "Center" button on the control GUI will place the probe close to the center of the Mont4K field of view and block most of the field. This position is located at X=7750, Y=8000. "Homing" the stage places it at X=0, Y=0; well out of the Mont4K field of view, but not within a range where guide stars can be seen. A move of 500 units in either axis of the guider stage moves the guider field of view by about 1 arcmin. IMPORTANT NOTE: There are very subtle (<<1%) scattered light issues with Mont4K. Because of this, it is currently recommended that guiding be done with the probe positioned as close to the default guiding position (X=2000, Y=2000) as posible. Also, flat field exposures are best taken with the guide probe at the home position (if you won't be using the guider system), or near the default position. Another IMPORTANT NOTE: Currently, the 'STOP' button on the guider stage control GUI is not implemented. Simply let the guider finish whatever move was initiated even if this brings it to a limit. Then, command the guider probe to move to the intended position. It is IMPORTANT to shut down BigGuider in the case of threatening weather. Shut down the autoguider GUI from the "File" menu or from the pop up menu displayed when clicking the right mouse button. Close out any associated guider windows that the GUI shut down misses. 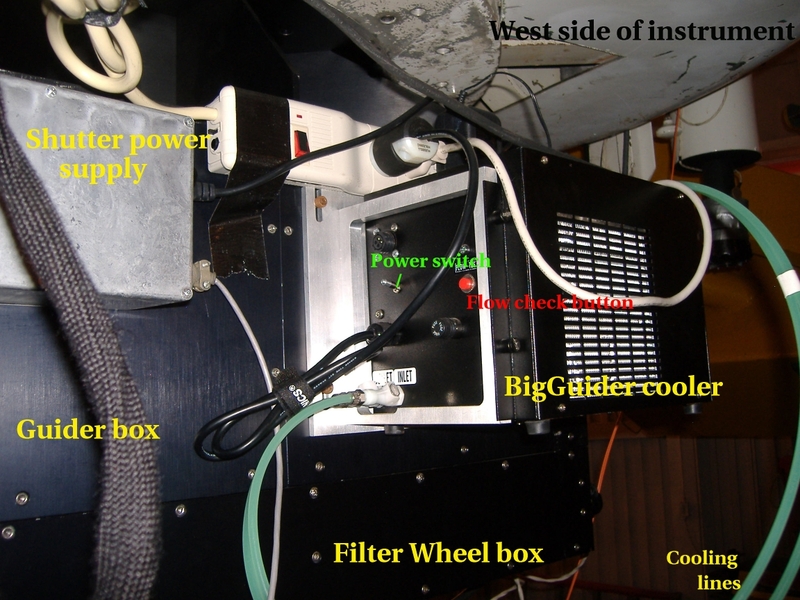 Turn off the power to the BigGuider CCD controller at the south side of the guider box. Turn off the cooling unit at the west side of the guider box. The toggle switch must be pulled out in order to be toggled. Power off the guider x-y stage. The switch is located on the south side of the guider box. Note that this will also power off the Mont4K filter wheel . Back to the Mont4K Manual. Back to the 61" Operations Manual. Back to the 61" Home Page.